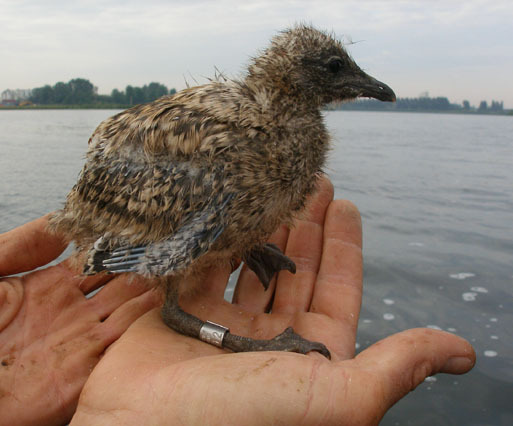 Sometimes a young Mediterranean Gull can be ringed in the colony, such as in Harderwijk on June 3rd 2008. Sometimes as bycatch during the Black-headed Gull research, a Mediterranean gull is captured and colour ringed. 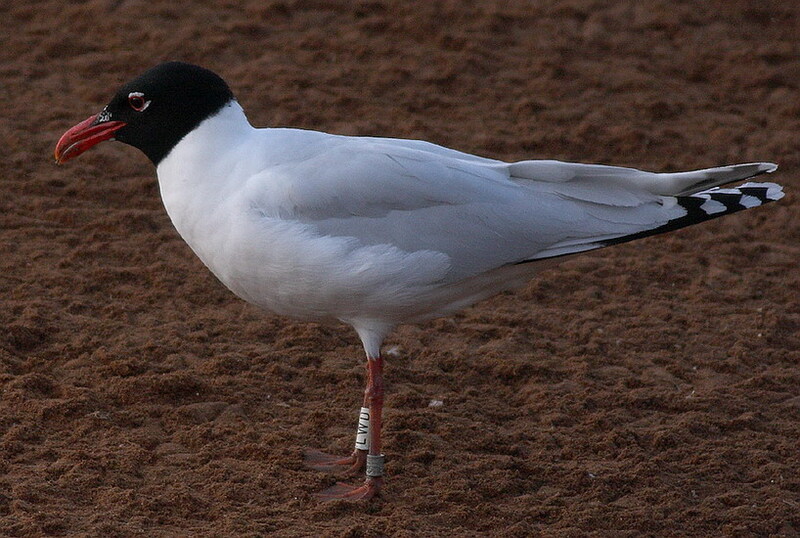 In total between 2000-2007 ten Mediterranean gulls were colour ringed in Harderwijk with White L-rings. Depicted are three letters, always beginning with an L (codes see below). From 2008 onwards white rings are used with four codes starting with a 3 (codes see below). In 2008 and 2009 in Harderwijk on De Kreupel (island IJsselmeer near Enkhuizen) in total ten Mediterranean gulls are colour ringed with these new codes. In 2010 on De Kreupel there were at least 40 pairs of Mediterranean gulls. We did not bring enough (new) colour rings with us... therefore approx. half of the young is ringed with old white L-rings. In total on June 24th 2010 we could colour ring 52 young Mediterranean gulls in a few hours time. Codes used: LAG, LCG, LDA, LDC, LDE, LDF, LDG, LDH, LDJ, LDK, LDL, LDN, LDP, LDR, LDS, LDT, LDU, LDV, LDX, LDY, LEE, LEG, LGF, LGH, LGM, LHG, LHP, LJG, LLG, LNG, LPD, LRG, LRX, LRY, LSG, LSJ, LTD, LTG, LUG, LVD, LWD, LWG, LXG, LYG, LZG, 31A7 through 31A9, 32A0 through 32A9, 33A0 through 33A1, 35P1 through 35P9 and 36P1 through 36P5. White LWD. © Camille Duponcheel 2009. White LTD. © Jean Michel 2009. 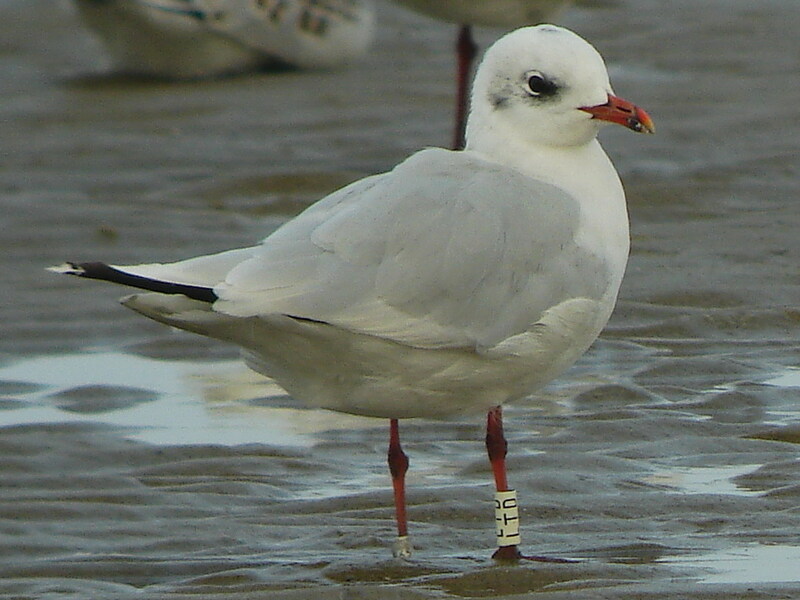 On the website http://medgull.free.fr you can find more information about research on Mediterranean Gulls.